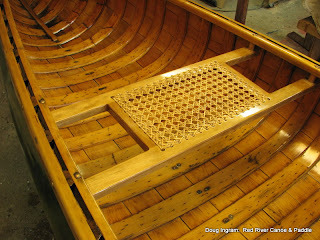 First, here is the new bow seat looking suitable old. Not really old, but it does look like it belongs. 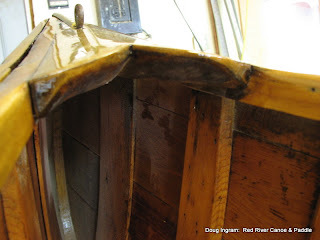 And the old stern seat for comparison. Its rare to find old cane seats without broken cane, this one is excellent. 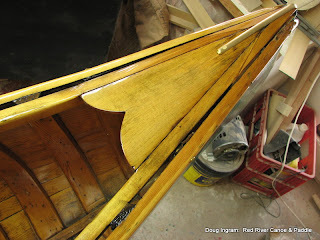 A little peak at the stern deck looking pretty under lots of new varnish. I took a tracing pattern off of this deck and compared it to a newer deck, it is practically identical. 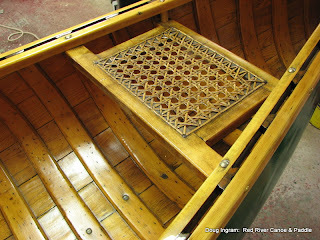 A nice feature of the old decks is the significant undercut which follows the crowning of the top of the deck. 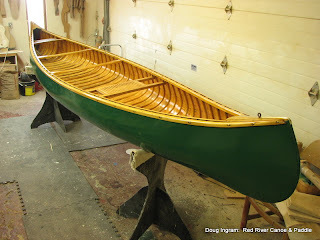 And, finally, the long shot showing the old girl all finished and ready for the water. Posted by Doug Ingram at 8:06 p.m.